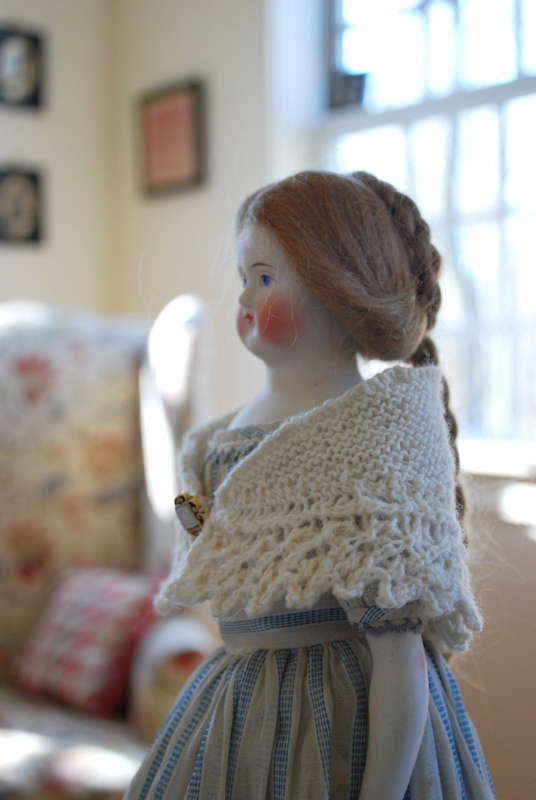 Helen is wearing her new shawl. I had to put on a thinking-cap (a knitted one of course) while it took me some days to formulate a pattern with size 0 needles. Knitting for Helen is the most frivolous thing I’ve done in a long time. 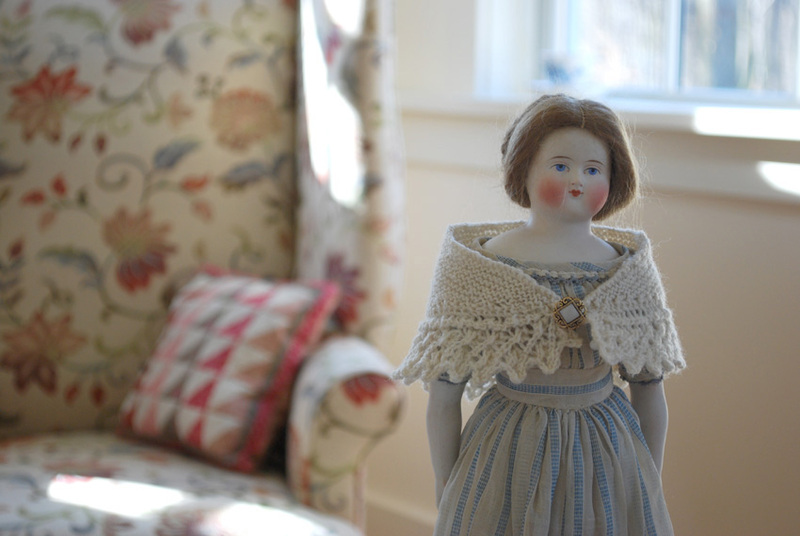 As this china doll was a housewarming gift from my sister-in-law I telephoned her with news of my frivolity. I thought she’d be pleased with the attention I was giving Helen. At first she didn’t like the sound of it. “Don’t dress and redress her,” was my sister-in-law’s authoritative remark. “She’s wearing her original muslin gown, remember? It’s fragile and more than 100 years old.” This came from a serious antique doll collector who knows her stuff, so I took heed. She laughed when her stern warning was over, glad after-all that I was enjoying the company of a fanciful member of the family – even if Helen, regrettably, must be admired mostly from behind glass. The craving to knit the shawl came after watching a favorite film (again.) (My men folk found other things to do that evening.) 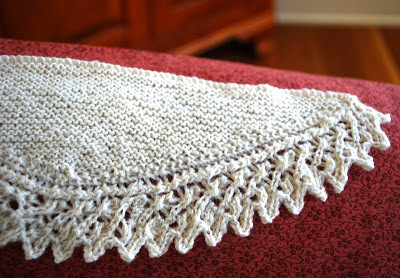 In an early scene of “Seal Morning” Aunt Miriam is wearing a delicate swallow tale edged lace shawl. 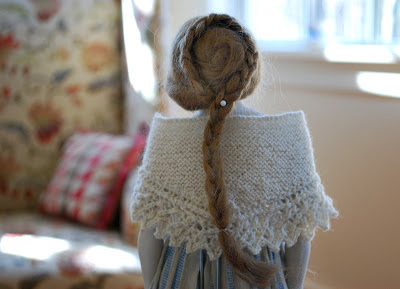 I chose "Molly's Lace" from Nicky Epstein's book "Knitting on the Edge." 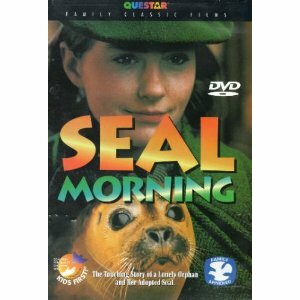 “Seal Morning” takes place in the 1930s on a seacoast of England. Rowena is orphaned when her parents die in a car accident. She is sent to live with Aunt Miriam. They meet for the first time – awkwardly. 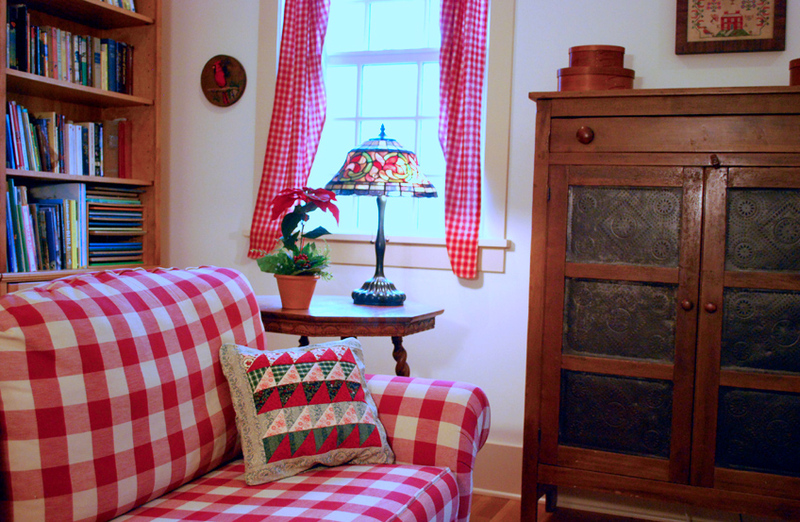 The cottage is tiny. Aunt Miriam’s income is slight. 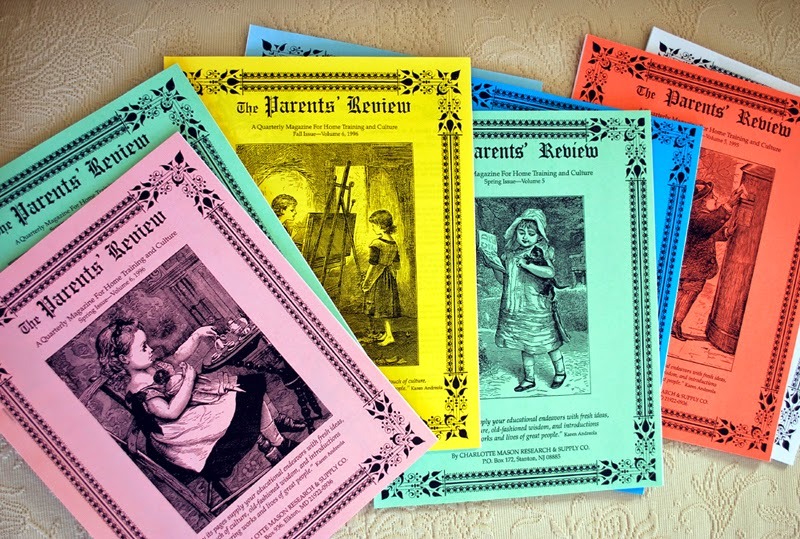 She works at painting china at her kitchen table, while at the same table Rowena works through her lifeless schoolbooks. The cottage is some distance from the nearest town by pony cart, but Miriam is comfortable living independent of friendship and welcomes the isolation. She prefers the company of animals to people. The seal pup Rowena rescues brings a bright spot into the dull days of Miriam and Rowena. Although we enjoy seeing the beautiful round-eyed seal I think the story really is about Miriam. She is a plain woman that has some pretty feminine ways about her in spite of how carefully she guards her emotions. Not naturally affectionate she softens up a little and grows in her love for Rowena, eventually confiding in Rowena a piece of her past. A fiancé broke the engagement. Miriam plans never to be so deeply hurt again. While walking along the sandy beach and through the lonely marshes, Rowena meets a biologist who is there to study a species of geese. She invites him back to the cottage. The biologist, Bernard, has gentlemanly manners. He and Miriam find that they share common interests. Their love of nature brings their souls together into a quiet (but very guarded) communion. I couldn’t help but notice Miriam’s domesticity. 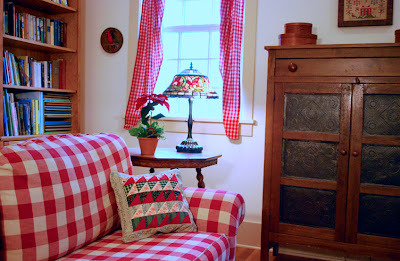 With meager means she keeps her primitive cottage neat and tidy. Her hands are busy serving with punctuality and care. 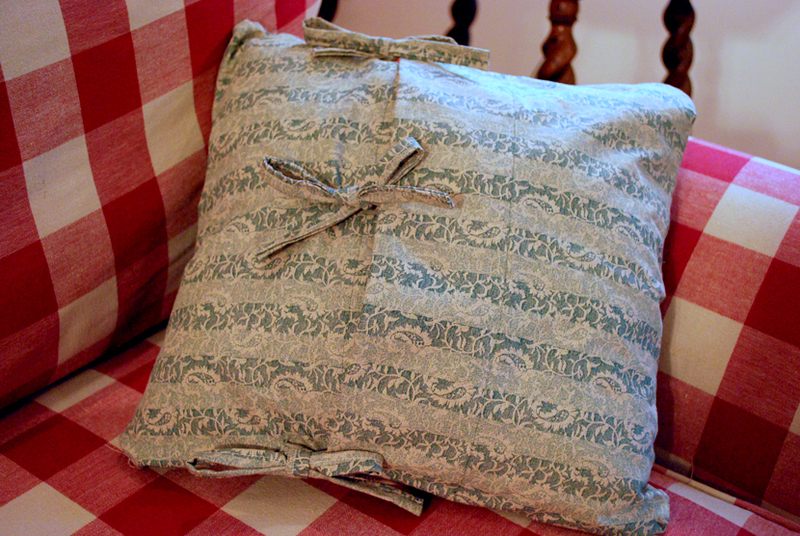 Linen conceals the rough table at mealtimes. For tea, little cakes are baked. While balancing a pie on one hand she trims the crust effortlessly with the other. Either the actress had practiced insanely much off-camera to make it appear natural, or pies are second nature to her. 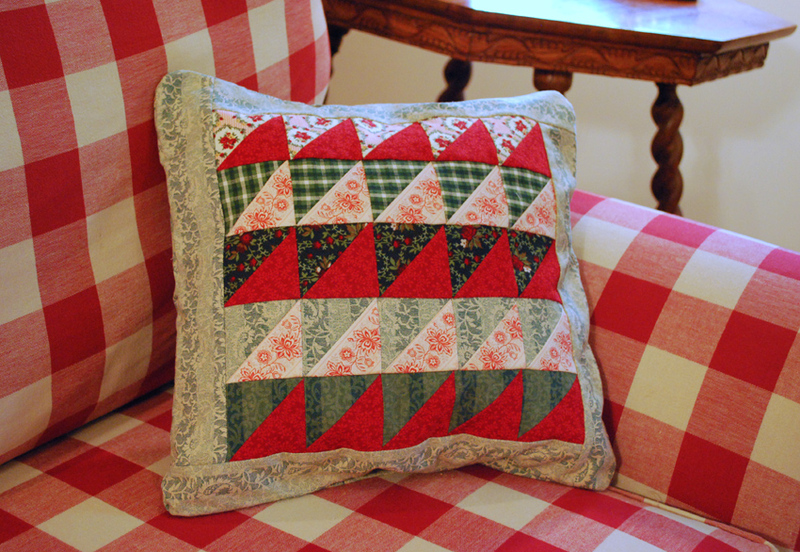 Christmastime Pillow Cover - I like to make triangles. Will Miriam decide that it is okay to need people? Some women resist giving into the soft side of their feminine natures – especially women today. 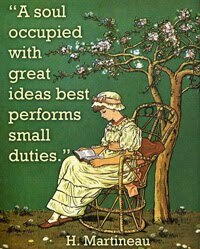 Although they have remarkable gifts, talents and strengths, rather than lean on a man, they stubbornly rely on their own resources and resist giving into their soft side. None of us, however, is meant to live autonomously. The pillow cover is enveloped and tied on the back. Another favorite film of mine is “A Little Boy Lost” with Bing Crosby. If you like hearing his velvet voice singing “White Christmas” this time of year as much as I do, you will also enjoy the few songs in this film. But more so you will be absorbed in the story – that is - once you get passed the flashbacks that take up a good portion of the first scenes. They provide important foreshadowing. This is another story about relationships, lingering hurt, and about admitting to oneself, “I need you.” When I feel like a good cry I watch this touching film. It is an instant play on line. Mr. Wainwright is an American radio journalist living in France who meets a French woman, Lisa. They marry. Soon WWII breaks out and Mr. Wainwright becomes a war correspondent. Just after Lisa gives birth Mr. Wainwright is sent on assignment to Dunkirk. Enemy invasion keeps the couple apart. While he works in England Mr. Wainwright learns that Lisa is killed. The baby – now a little boy - is lost in the shuffle - like so many children during wartime. Carrying the dull-ache of his sorrow around with him for years, he fools himself that he doesn’t need anyone – not even his true friend, whom he resents for acting as his conscience. Will Mr. Wainwright love, and trust again? Will he find his son when he travels to an orphanage in France or will he give up the search when he meets with discouragement? 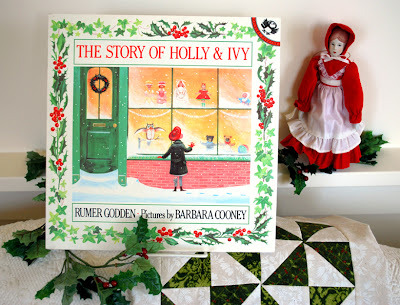 The Story of Holly & Ivy by Rumer Godden is a tale that melts my heart at Christmastime. 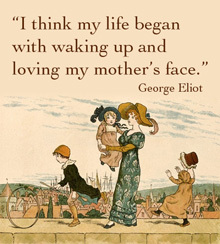 It is a beautiful book and a beautiful story. 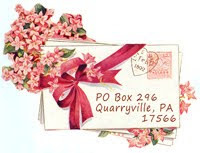 You may already know I am fond of Barbara Cooney’s nostalgic, folk-art illustrations. Although this children’s story is a bit fanciful to be realistic fiction this is precisely what makes it so endearing for those of us who believe in miracles. 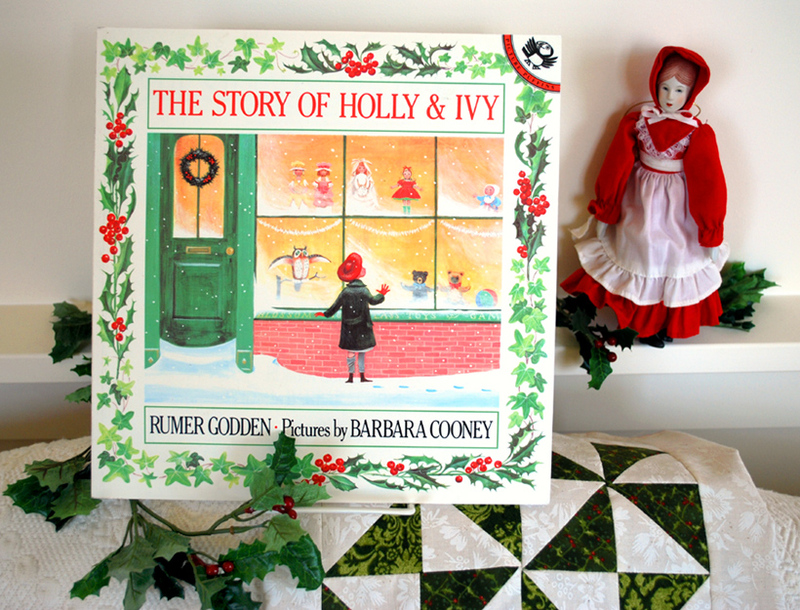 Ivy is a little orphan girl with a keen imagination and a longing for a doll of her own for Christmas. She also wishes to live in a quaint town in a family of her own. Holly is the doll in the red dress displayed in the shop window wishing for a little girl to play with her (not to be admired behind glass like my Helen). 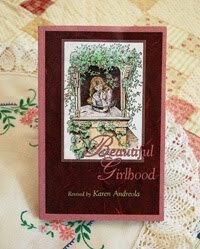 Childless Mrs. Jones, the policeman’s wife, wishes her Christmas gift could be a little girl. Reading how all these wishes come true may bring a tear to your eye. 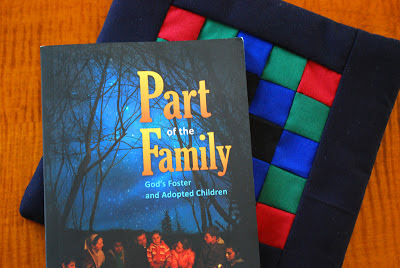 Although the book, Part of the Family is meant to be an encouragement to foster and adopted children the book quite unexpectedly brought healing to my heart. Some remarkable people in the Bible were separated from their biological families. God used their foster care and adoptive families for His purposes. 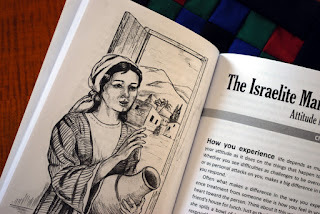 In these short chapters children will read the story of Moses, Joseph, Samuel, Esther, Daniel, the Israelite maid in Naaman’s household, Jesus (who had a stepfather) and others, in a new light. Loses in our lives can make us feel gloomy, forgotten, unimportant, but God can use loses for blessing. Trusting in His sovereignty we can rise above the seeming injustice in this fallen world with trust and gratitude. It is clear to me that author Merle Burkholder (who has cared for foster children) has compassion for young people struggling with this sensitive topic. 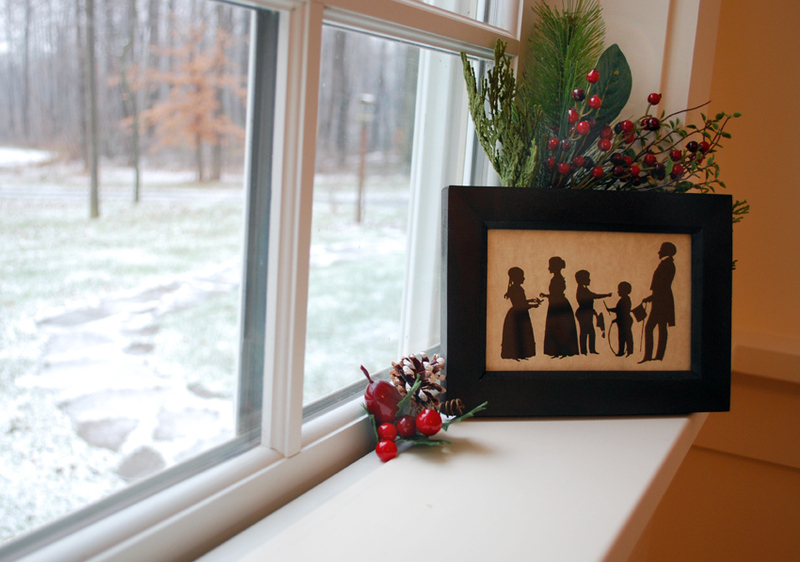 A light snow fell the day I decorated the parlor windowsill. I believe Part of the Family will comfort adults, too, with lingering hurt, adults - though not fostered or adopted - were perhaps raised with an unaffectionate stepparent or absentee parent that they need to forgive - or were brought up in an unbelieving household. All Christians, young and old, can take joy that they’ve been adopted into God’s family. With courage and humility we can say, “I need you.” In loving God, serving, trusting, needing Him - and one another - there resides our source of joy. Crawling out of its hiding place into the sunshine a woolly bear posed itself on a pot of thyme just outside the kitchen door of the Lady-of-the-House. It came and went in early autumn, sunbathing regularly at this same spot. 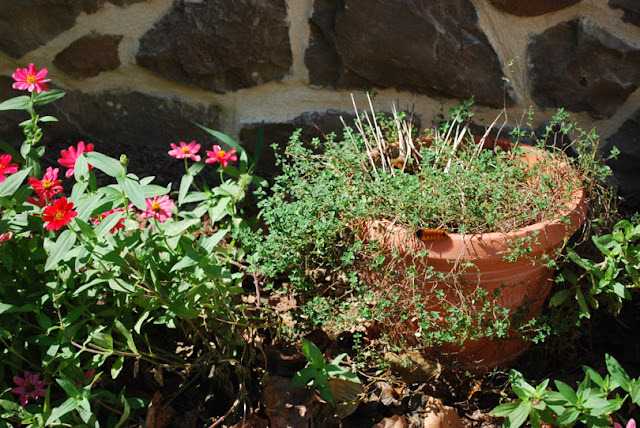 The Lady-of-the-House started thinking of it as her pet of the patio. She only disturbed it once to cradle it in her hand and watch it curl up into a ball of bristles. 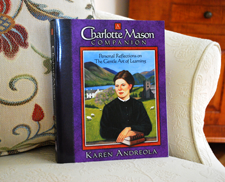 Then she came into the house and opened to page 82 in Lessons at Blackberry Inn to refresh herself with the folklore of the Isabella Tiger moth. In its caterpillar stage it is said to have the ability to predict the weather. 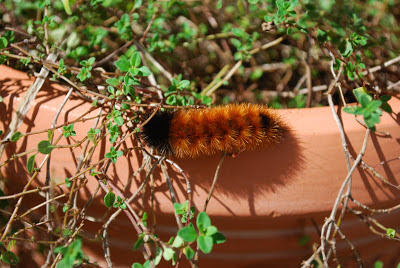 A few weeks after observing her “mostly brown” optimistic caterpillar, the enormously expansive storm Sandy approached the east coast. The Lady-of-the-House was busy preparing and serving. 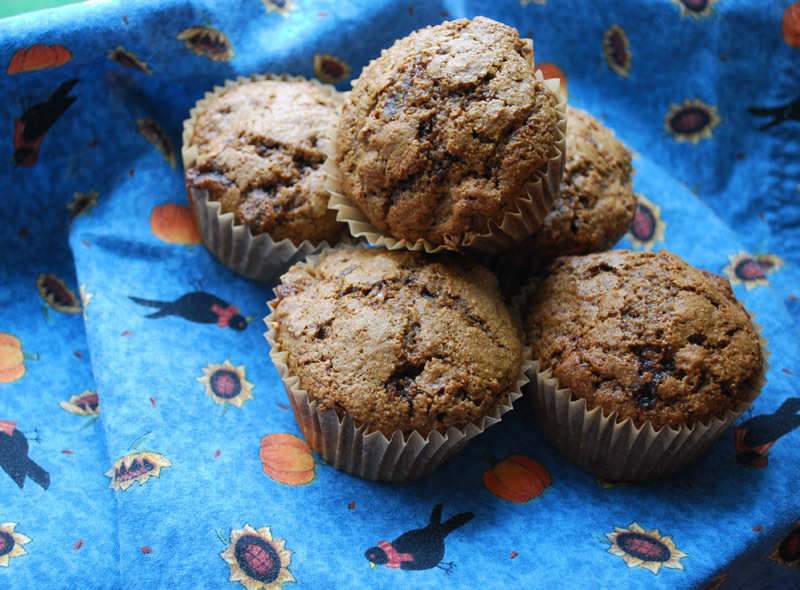 She started by baking a big batch of molasses muffins and then kept her kitchen simmering and her washing machine spinning. For days all her thoughts were passing thoughts. Full of care she urgently focused on doing the “next thing.” At bedtime she found that she could concentrate on not one paragraph of her novel. She closed the book. The storm hit in the night. In nervous wakefulness she heard the wind roar in the trees and the rain pelt at the window glass. But in the morning little damage was found in the neighborhood. How very thankful she was. Calm was restored. But she couldn’t help thinking, “There might be something to the woolly bear’s ability to predict winter weather but when it comes to autumn it is far from the mark,” she nearly said out loud. 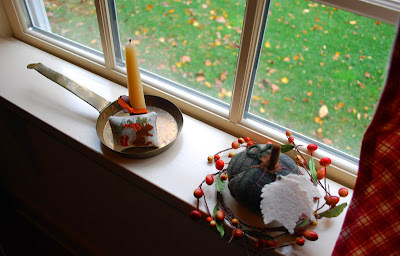 During the storm rigmarole, the Lady-of-the-House appreciated the autumn decorations out of the corner of her eye. And does so now. What a funny crooked handle this brass candle pan has. It seems to have been made in haste or by an amateur. It is an antique find of the Man-of-the-House. He thinks it unpretentiously reflects the everyday wears of the everyday man at a time when electricity was unavailable for lighting hallways. Resting inside its pan is a tiny autumn ornament - a squirrel minutely cross-stitched on linen, a gift reflecting friendship afar. 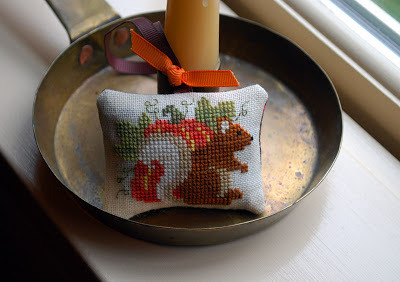 Also on the family room windowsill sits her newest pincushion. A circular sprig of faux autumn berries surrounds it. 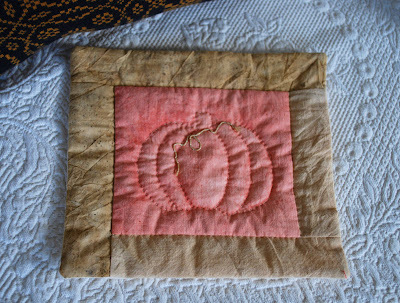 This gift to her was sewn from the wool fabric of a cast-off skirt purchased at a charity shop. Deft fingers turned it magically into a pumpkin. 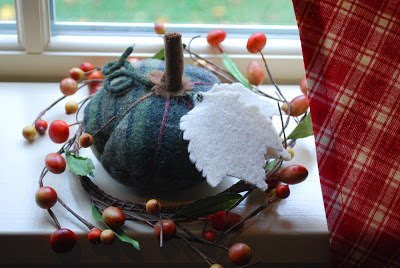 The leaves are to hold the needles so they won’t get lost inside the pincushion. Has this ever happened to you? 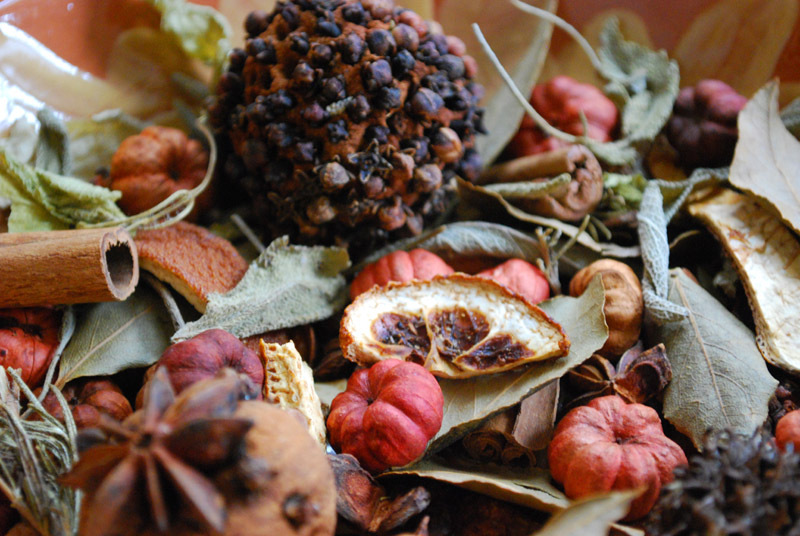 Potpourri lends its spiced autumn fragrance to the air. 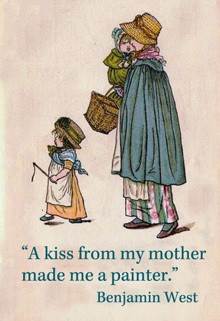 “Mmm, it smells good in here,” says the son of the Lady-of-the-House when he enters the room where his mother sits writing you on her laptop. She points to her bowl. He nods. She smiles. 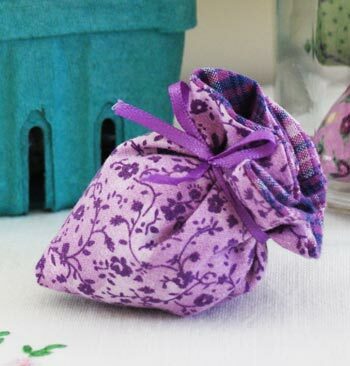 The Lady-of-the-House has a friend who is frugal in the most creative ways – ways that enable her to provide frugal niceties as well as frugal necessities for her family. 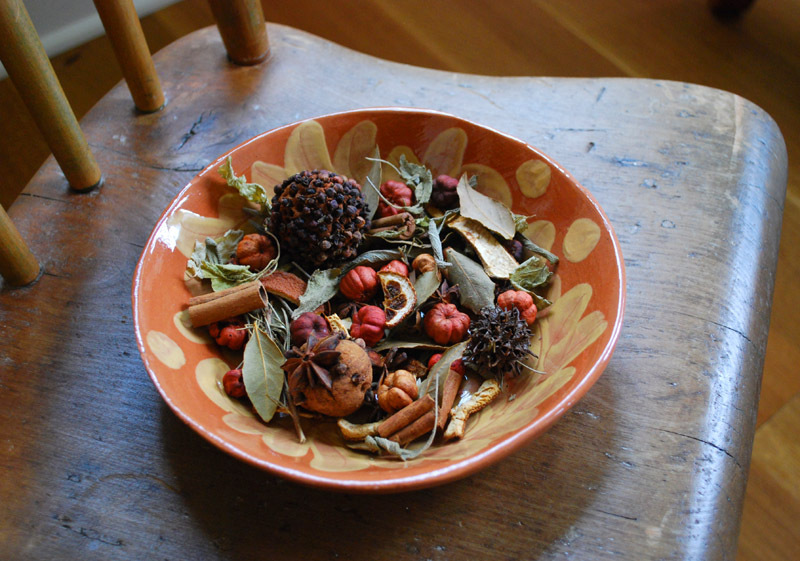 The potpourri is a nicety from this friend who used resources close at hand, such as dried sage and bay leaves from the garden, orange peel, and spice balls made with cinnamon dough studded with cloves. How fun. 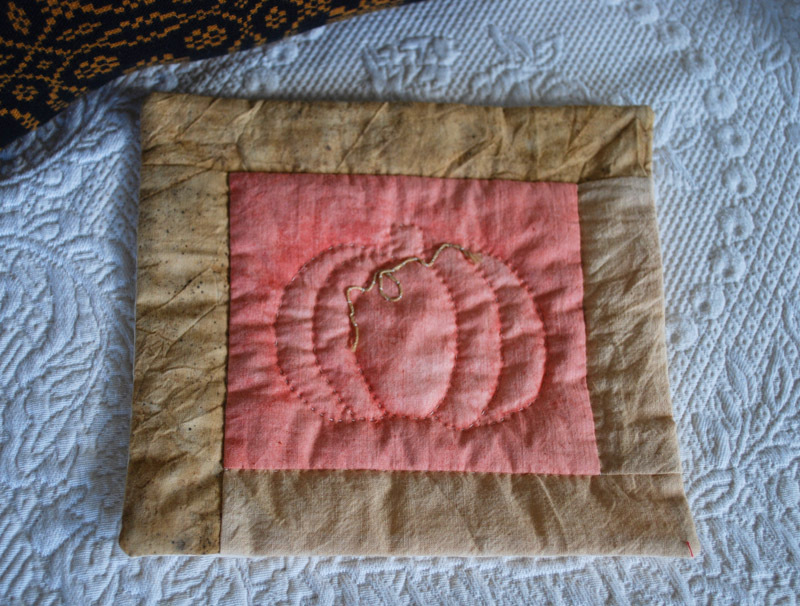 This hand-quilted square was pieced with naturally dyed cotton. 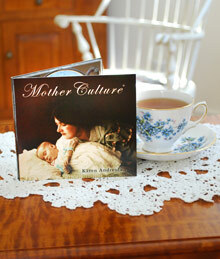 It is a souvenir of a living history museum. A paper pinned to the back reads that that the brown came from acorns, the orange from madder, and the tan from tea. I think Blackberry Inn’s Dora would be charmed by its primitive handiwork. 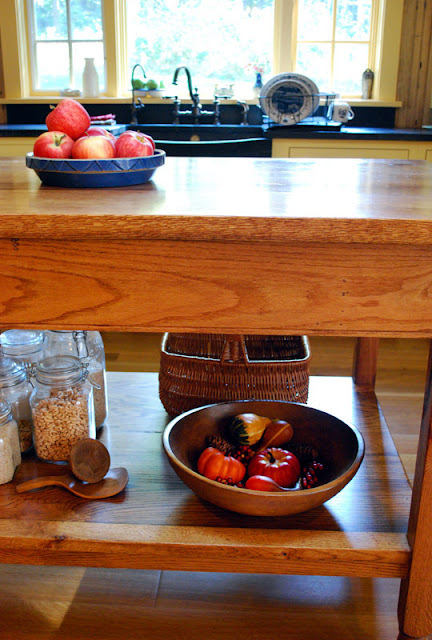 An antique wooden kneading bowl brightens the low shelf of the kitchen’s farm table with a faux harvest. Speaking of kneading, with evacuees staying over during the storm, the Lady-of-the-House prepared some comfort food. 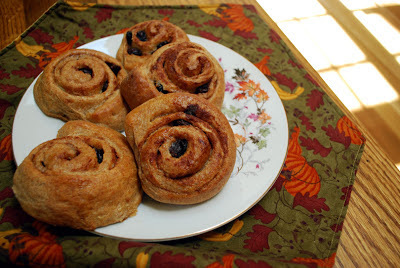 She rolled out whole-wheat bread dough for cinnamon buns. Conscientiously, she halves the quantity of brown sugar and butter listed lavishly in most recipes - using coconut oil in place of some of the butter. Less “sticky” than most, they are still very much of a treat for the Man-of-the-House. But one doesn’t need an approaching storm to make them.